Sandy Patterson (Jason Bateman) is an average Joe businessman who has just gone out a on a limb and taken a new job to gain more financial security for him and his family. He gets a call from his credit card holder saying his identity has been stolen. After he finds out what the woman looks like, he travels from Colorado to Florida to track down the person who is claiming she is Sandy Patterson (Melissa McCarthy) and regain his stolen identity. It's no secret that we're not Melissa McCarthy fans. I think she's got so much more potential that the "crass and crude fat girl acting like a tomboy" role. 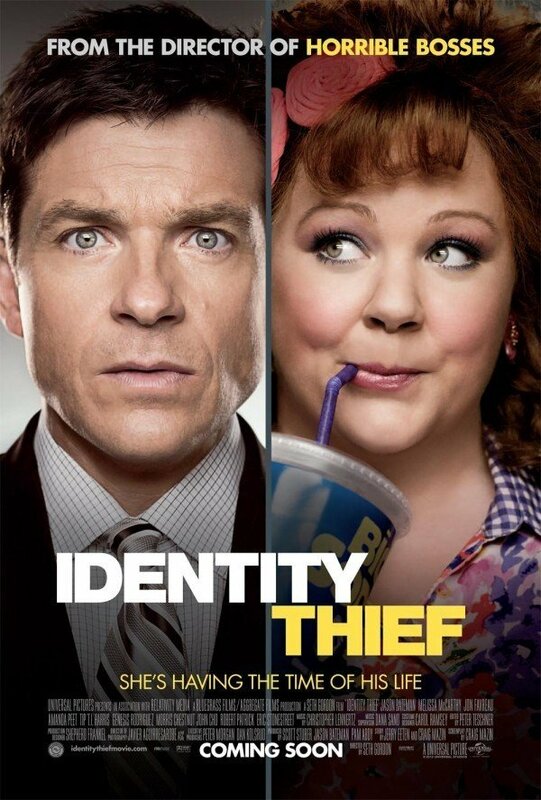 "Identity Thief" has been my favorite Melissa McCarthy movie thus far, but that's not saying much. There are a few laughs in this movie, but not many. The script is what suffers, here: it's just bad no matter who is cast. The actors do the best with what they were given, but it's still not very strong. We don't like this trend of how police officers and government agents are portrayed as bumbling, completely inept, powerless people, so much so that they encourage a private citizen to go and play vigilante to get back his identity...I know, "suspension of disbelief," but that's just ridiculous and would never, EVER happen. Ludicrous situations seem to run rampant in Melissa McCarthy movies, she's almost becoming a female Adam Sandler, where nothing is believable anymore. We "LOVED" this movie, and found plenty to laugh about. I laughed way more during this movie that I have during any of her other ones!